All Slideshow images are by Kristen Blush. I have always wanted to be one of those sign waving Hillary supporters up on the stage behind her at a rally. 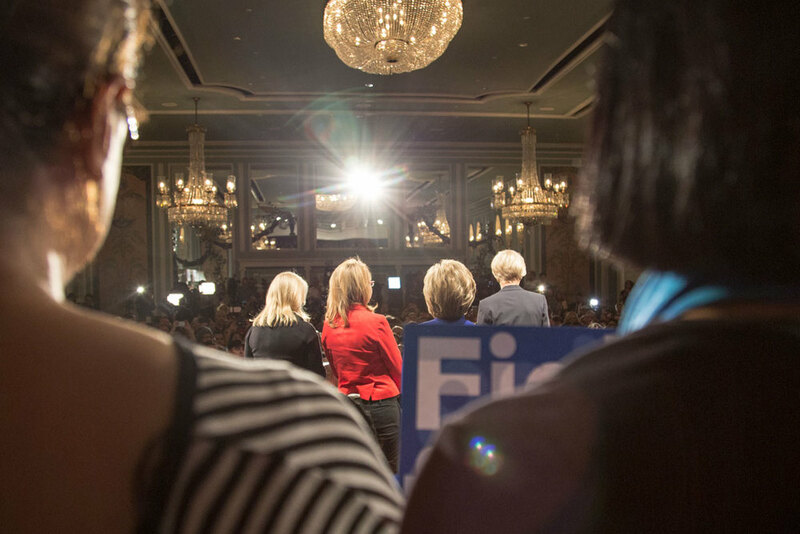 Today I had the opportunity to do that at the Women For Hillary & "Get Out The Vote" event at the Hilton, in NYC. My friends Jennifer, Bettina, and Gretchen joined me in this moment with Hillary, Kirsten Gillibrand, Gabby Giffords, and Cecile Richards. It was very meaningful to be on stage with these incredible Women. Women's Rights are one of the leading reasons why I support Hillary Clinton, and to be there with the President of Planned Parenthood, who endorsed Hillary earlier this year, felt very symbolic. This journey we are on to elect our first female POTUS is rich with other strong women and feminists, and I am very proud to be a part of it. We were all asked by event organizers to be discrete with photo taking, but as you may imagine it's very difficult to conceal a Canon SLR. I managed to capture some special moments from behind the all female group, and ended up in several media photos following the event. It was fun to be in photos with Hillary and her all female cast. Gretchen Baer was present with her Hill Car (photo'd above in the slideshow.) After the event we went out of the Hilton to street level in Times Square where the Hill Car was parked. It was really wonderful to meet Gretchen in person and see her gorgeous hand made Hillary outfit. Gretchen is undeniably a gifted artist, and I know I'm not alone when I thank her for using her talent to support Hillary Clinton. This event was held on April 18, 2016, the day before the New York Primary. Kristen Blush on stage before the event. A media photo from the event. My green hair making a colorful moment with Gabby's orange jacket.